February is over and it was a very wild month. Very volatile, dramatic, and to some scary month. At the beginning of the month the market corrected more than 10%, then we recovered some but Powell first then Trump with his tariffs sank the markets again. No matter how scary these moves are, I actually like them because that is how I can make money. Lately I was able to ride this market down as well as up and bring in way over $6,000 dollars in revenue in February and in just two days of March 2018 way over $4,000 dollars revenue. 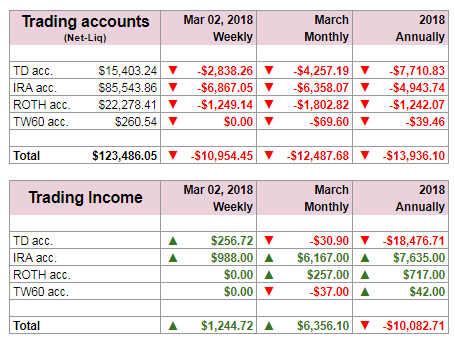 As the table above shows, we had a great income in February, most of it in IRA account as ROTH and TD are too small to trade more frequently. But if you look at our net liquidation values (net-liq) we are down. It is because we still have many open positions which are now losing value. These positions are still well out of the money (OTM) except two or three trades which are in the money (ITM) and will need adjustment in the near future. As the market starts recovering from the mess, these trades will once again become better. And our net-liq will start going up again. And if not, we will adjust those trade to improve. As I mentioned above our trading activity today was another great endeavor. 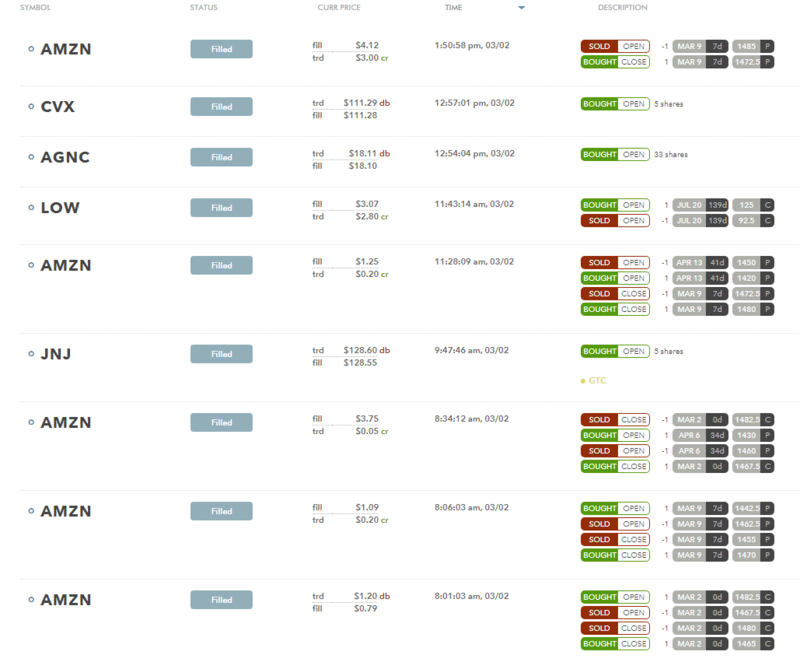 When the market tanked in the morning I could ride it down, mostly Amazon (AMZN). When everything changed suddenly (and I do not know why and do not even care why the market reversed) and started going back up, I rode it up too. Another beautiful day in the stock market. While others are panicking, we are making money. We brought in another nice $2,059 dollars today. I trade options to generate income which can be used to buy dividend stocks. That was always my goal and dream as well. Make enough income which can be invested. Then I can keep my job income for supporting my family. 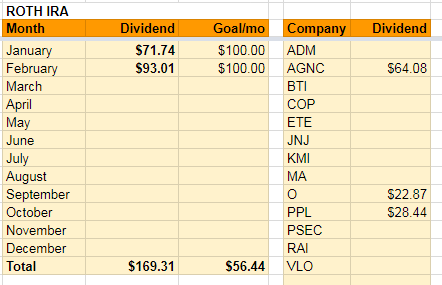 I use 50% of my options income to buy dividend growth stocks. I am still bullish but I think the bull market is getting closer to its end. My estimate is end of 2018 or first half of 2019. I believe it will be partially due to Trump’s incompetent and protectionist policy which would kill tax cut benefits and lead to the economy slowdown. But before all this ever happens I believe we will see yet one more all time high and then we may see troubles unfolding. But I may be wrong. I am usually always wrong in predicting the market. I want to trade the market no matter what it does. That’s my ultimate goal – to learn how to trade the market up or down. Make money no matter what the direction is. 1) Discipline and not over trade. Always have enough money in your account to sustain drops like this one in February and be able to manage your trades, adjust them, and escape bad trades. If you have a small account, trade only one trade at a time, or save more money before you trade. 2) Stay calm. Do not panic. If you are in a trouble, roll your trades away to buy time and then when all is calm, adjust. 3) Do not sell your stocks when they go down. Wait until all is over. Remember why you bought the stocks in the first place. I bought mine for dividends. Then I don’t care what the price is doing. I am not selling for capital appreciation. 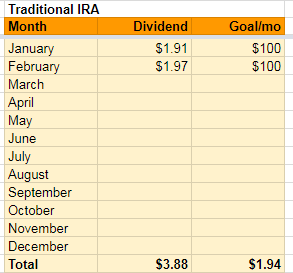 I am a dividend investor. At the end of any panic or bear market there will be a start of a new bull. If you invested before 2008, sit through 2008 selloff, reinvested dividends, and even bought more shares, your account is not way higher than before 2007 end. 4) If you want to be a bit active investor and trader, learn and study the markets. There is always a lot to learn. Play with your trading positions, simulate your options and way how to roll them, fix them, or adjust them even if you do not do it. But the trading platform will show you what you can do and if you see that your situation is hopeless, learn what else you can do to adjust a trade. For example, you have a deep in the money put spread. That is impossible to fix on its own. You play with the trades and find out that you can roll into calls for a small debit and sell new OTM put spread to offset the debit. 5) If everything goes your way DO NOT BE GREEDY!!! Boy how may times I was guilty of being greedy and opening more trades because everything was great and all trades were winning just to see getting myself in trouble the very next day when the market changed direction. There are many possibilities to trade. Learn them and find those which work best to you and if you stay calm and never panic, be greedy, base your trades on expectations rather than trading what you see, you will prosper and be consistent. Where can I see your februar income ?! This was my problem for the last months too. I would like to add your income through options to my community post. I now record all my accounts and do it on weekly basis usually either every Friday night or Saturday morning. The best way is to go to “Trades & Income” page and there you will see “All accounts Trading Results” section with a table. The displayed table is the latest one from last week Saturday (since it was recorded on Saturday and it was already March the table says “March” but in fact it is the last February record. The first part of the table is net-liquidation value (or market value) of the accounts. These numbers fluctuate a lot based on the market volatility. this definitly helps, thank you very much. So, I look for the march monthly trading income, this is for february. And i will look april monthly trading income for the march result, right? I also added a summary of each month to Trade & Income page for easier review. Yes, the March results will be published the last Friday or Saturday of March which is 30th or 31st. April will be published Last Friday or Saturday of April which is April 27th or 28th. It will always be last Friday or Saturday of the month.